Here's a typical Sunday for yours truly. Wrote an article promoting Superbrothers: Sword & Sworcery EP, which can variously be understood as a meandering mythopoetic adventure, a Jim Guthrie album that you can hang out in, a test for sociopathology, and a rather pleasant diversion concerning hatred of rainbows. Listened to the fantastic soundtrack while doing so. Listened to Joy Division live at Paradiso, Amsterdam (11 January 1980) while reading select bits from Derrida's Of Grammatology. Hey, does anyone have a full electronic copy of that book? Please let me know! Posted in the Nature Recordists newsgroup on the minimum audible angle as applied to sound source localisation. And also got involved in a discussion of field recorders (as always). Made a green curry (fish) which, if you must know, is far better than any green curry you are going to buy in this country's restaurants. It does take a bit of work, and this is the first time I tried it with whiting. Only for the spice lovers (AKA food lovers). 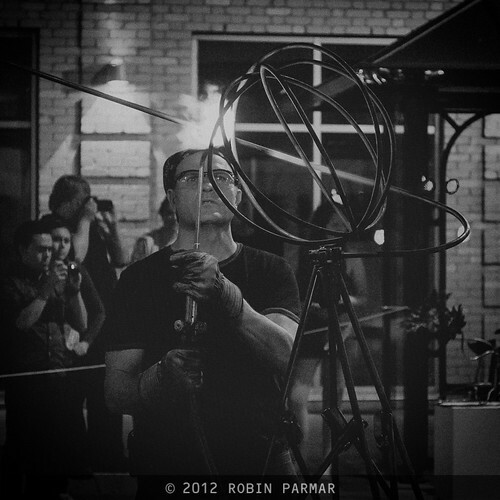 Edited and posted my photos from the Nuit Blanche event of 16 June, which fortunately coincided both temporally and spatially with my visit with my good friend Chris in London ONT. Includes the Nihilist Spasm Band and Jeff Workmeister (Audioforge) shots available here. Wrote emails to fellow sound artists about upcoming visits and collaborations. Read various aggregated news feeds while listening to The Peanuts, the twin sisters Emi & Yumi Ito, most famous for singing "Mothra No Uta" to a giant Lepidoptera. Then wrote this very post you are reading before I got too tired of twee. So that was a typical day in the life, except that I didn't do any audio editing or composing. But I guess there's always tomorrow. P.S. This blog now contains over 600 articles and gets about 10,000 page impressions a month. Not bad for something I never promote. I hope you like it. If you like some bits more than others, let me know about those.